Leading them out: Connacht coach Pat Lam will be looking for a winning start to his sides title defence this weekend. Photo: Sportsfile. New season, same goals, but one big difference. For the first time in the history of the Pro 12 competition Connacht Rugby start as reigning Pro 12 champions. Never in Connacht Rugby's history has there been more anticipation than hope. The Galway Sportsground is expected to be a sell-out, and for a third successive visit Glasgow Warriors are the opponents, ensuring this season's League will open with a bang. "Third test match, isn't it," says Connacht coach Pat Lam of the challenge the former champions pose, which he says has all the ingredients of a big occasion. "It's their third straight game here, so we know they will be well up for it. Everything points towards a pretty fired-up Glasgow team, which is a great way to start the season, " says Lam. "We know the importance if you start the season well, it's not the be-all and end-all, but it helps. We are close to a sell-out - only a couple of hundred seats behind the posts - which is great, Sky TV is here, Nigel Owens is reffing again, and it's a big fixture, so both teams will want to start well." Having dethroned the 2014/15 champions last season, Connacht may have the psychological advantage heading into Saturday’s opener, but Lam says every team is starting fresh. "Expectation is certainly out there. We know how tough it is to win this, but we don't focus on that because we will be in trouble if we do. Our expectations are in the way we do our training, how we perform. Every team in the Pro 12 wants to win it, and everyone starts with zero points this weekend." Lam's arrival has certainly moved the goalposts. Champions Cup rugby has always been the goal, but now it is must-do.
" The first goal is to get into the top six and that is part of our strategic plan, that is non negotiable. We want to be there every year, and that is the main focus. Then the top four, and then a home semi-final, and then the final. That is the process, but you have to start with the bottom line and this week there are five points on offer." Once again, given financial limitations, Lam has added astutely to his squad with young talented players in key positions. Of the 41 senior pro squad members, seven are new recruits, including former player and Galwayman Eoin Griffin, and three New Zealanders, including Irish qualified Josh Rowland. "The reason we put a big emphasis on retention is because of the way we play, " says Lam. "it's teamwork, knowing your job, and the guys who have been here into the fourth season have the advantage, but it's a waste of time if the other 10 per cent of the squad don't know their roles. "That has been the big emphasis for the new guys to quickly pick up, get to know guys better, pick up the systems and their jobs, so we have been trying to accelerate that process." However Lam is facing injury woes ahead of the opener, particularly in the second row where two senior players are unavailable, and three U20s Cian Romaine, Peter Claffey and Cillian Gallagher are also sidelined. Quinn Roux (hip ), Andrew Browne (thigh ) are currently undergoing rehab from pre-season injuries and are unavailable for the next two to three weeks, while Ben Marshall continues his recovery from last season's head injury. Back row players who could cover Sean O’Brien (ankle ) and Eoghan Masterson are also out injured. As a result Ultan Dillane can be expected to fill Aly Muldowney's boots, partnering either Danny Qualter or new recruit Lewis Stevenson. And with back row Jake Heenan recovering from a nasty hand injury, Nepia Fox Matamua is ready to take his chance after missing most of last season with injury. In the backs John Cooney (shoulder ), Craig Ronaldson (thigh ), and Darragh Leader (hand ) are sidelined, while new recruit Marntiz Boshoff will not arrive until the end of the Currie Cup in South Africa. The good news is that Jack Carty has fully recovered from his spleen operation. "He ran out of time to compete at the end there [last season], but to have that break and have a really good pre season, there have been no issues. He's trained really well during pre season and he's excited. An injury like that gives you perspective when there's a decision about career, and we have seen that in Jack, bouncing around, enjoying his rugby, and and we expect him to have a good season." 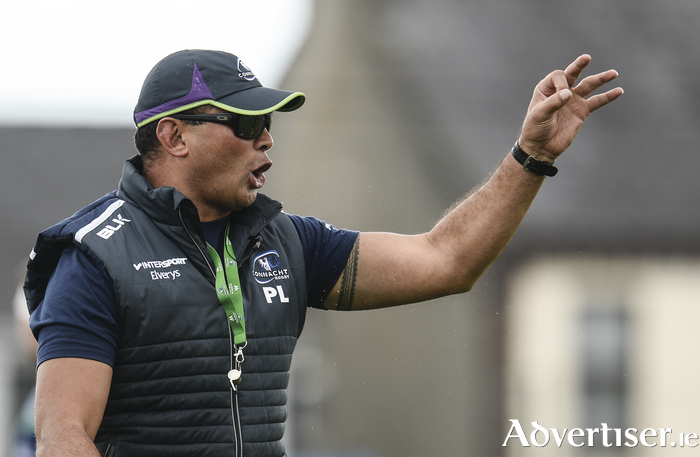 After last season's heroics, several Connacht players were selected on Joe Schmidts travelling squad to South Africa, and Lam says they must now take a leading role. "Joe has given them strong messages what they did well and their work-ons. They should be leading in their provinces and showing their abilty. That has happened since they come back, and there's been a big difference off the field in the sense of their contribution as leaders now, and that is the way it should be. There is a responsibility when you achieve something like that, and they are all hungry to go further." Saturday's game will be an early test of Connacht's credentials to become only the second team to put back-to-back titles together. Connacht boast a strong home record - having lost only to Ulster last season. "Home is important to our supporters, which is important to the guys. It is an area we want to protect, but we are under no illusion everyone wants to knock us off here as well. We only lost one, and it's straight up for grabs again, and we will face that every week. We want to win, but it comes back to the quality of the work we do during the week. We've had a good pre-season. We would liked to have had more games, but we have worked hard on the training field and we will certainly finish off the rest of the week and that will give us the confidence to go out there and hopefully perform to our best."